The human figure is the most perfect form in nature with all its intricacies, folds, and imperfections. In my drawings, the spirit of the body emerges to mark the ever-changing flow across the surface. These seemingly abstract compositions create layers that transform the images into an intricate network of line, color, and shape, and the organic nature of these large-scale drawings continually evolves and changes. The line and negative shapes become enmeshed into one. Nature gives us much more to see after it comes to the end of its cycle of life. Like the human form, its complexities surface to reveal an entirely new set of intricate views. Looking deeply within the drawings from nature, delicate lines emerge to create a similar network of color and shape that transforms how we interact with the art. 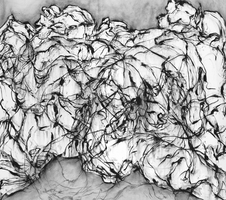 These large-scale drawings generate a movement that pushes the image to grow beyond the edge of the paper.